The game winning shot at the 2016 NCAA basketball championship game. The NCAA has extended its TV deal with Turner Broadcasting and CBS Sports to air its basketball championship game for another eight years. The extension to the current deal -- for a combined total rights fee of $8.8 billion -- will keep the big game at Turner and CBS until 2032. The new deal will allow Turner, which like CNN is owned by Time Warner (TWX), and CBS Sports to air live coverage of the championship games across multiple platforms -- including platforms that haven't even been created yet. This year's championship game between North Carolina Tar Heels and Villanova Wildcats was broadcasted on cable for the first time in the tournament's history. 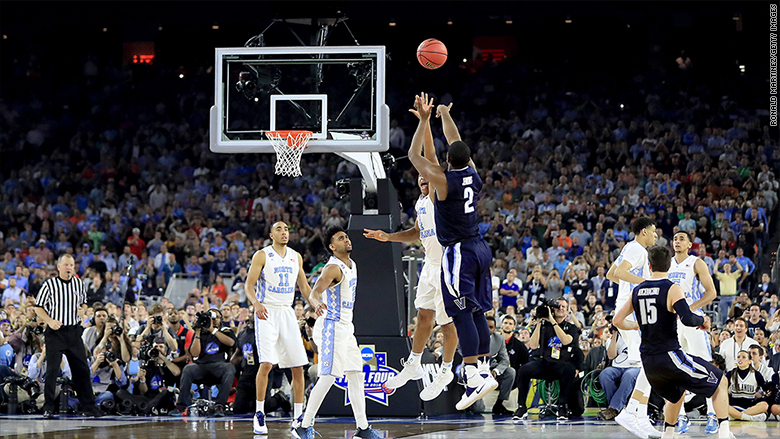 Despite Villanova's Kris Jenkins hitting the game winning shot at the buzzer in one of the most exciting championship games in recent history, the game fell in viewership from the prior year. The thriller garnered an average viewership of 17.8 million down significantly from the 28.3 million who watched Duke beat Wisconsin for the title on CBS the year before. In 2010, the NCAA and Turner and CBS made a $10.8 billion deal that reached until 2024. That deal is now extended to 2032. The extension is the latest in a series of long-term TV sports deals. Leagues like the NFL, Major League Baseball, and NBA have deals with TV partners into the next decade. The extension is also a symbol that in this ever-changing media landscape, live sports are the most stable products for networks and its advertisers.